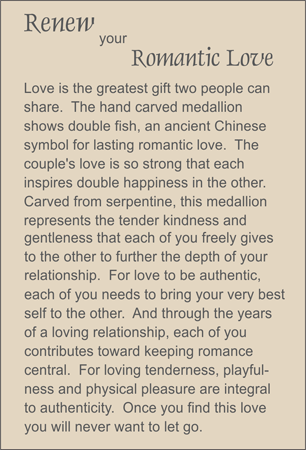 MEDALLION: Poppy-colored serpentine hand carved medallion showing two fish (the couple) surrounding the symbol for double happiness. ACCENTS: Faceted rock quartz crystal globe and ellipse. COMMENTS: Want to find a new special person? Use this TRULYHUMANmedallion to focus your powers of attraction.